ROCHESTER, New York—The games in the fourth class of The Strong’s World Video Gamed Hall of Fame® battled enemy starships, avoided tackles, climbed through dark tunnels, and fought off fantastical creatures to win their esteemed places in the hall. 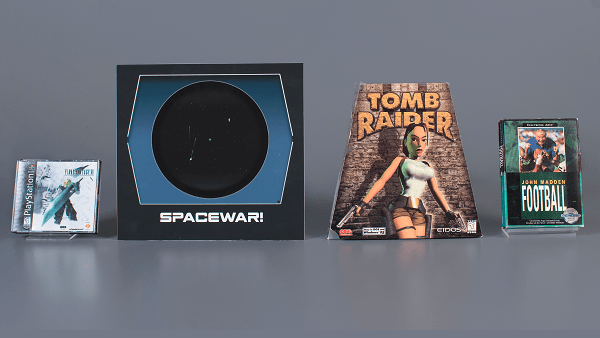 Spacewar!, John Madden Football, Tomb Raider, and Final Fantasy VII have been inducted into the World Video Game Hall of Fame and emerged from a field of 12 finalists that also included Asteroids, Call of Duty, Dance Dance Revolution, Half-Life, King’s Quest, Metroid, Minecraft, and Ms. Pac-Man. The four inductees span multiple decades, countries of origin, and gaming platforms, but all have significantly affected the video game industry, popular culture, and society in general. The above game titles have been newly added to the list of previous inductees which include: Donkey Kong, DOOM, Grand Theft Auto III, Halo: Combat Evolved, The Legend of Zelda, The Oregon Trail, Pac-Man, Pokémon Red and Green, Pong, The Sims, Sonic the Hedgehog, Space Invaders, Street Fighter II, Super Mario Bros, Tetris, and World of Warcraft. The World Video Game Hall of Fame at The Strong was established in 2015 to recognize individual electronic games of all types—arcade, console, computer, handheld, and mobile—that have enjoyed popularity over a sustained period and have exerted influence on the video game industry or on popular culture and society in general. Inductees were announced at The Strong museum in Rochester, New York, on May 3, 2018 and are on permanent view on the museum’s second floor. Anyone may nominate a game to the World Video Game Hall of Fame. Final selections are made on the advice of journalists, scholars, and other individuals familiar with the history of video games and their role in society. The Strong is a highly interactive, collections-based museum devoted to the history and exploration of play. It is one of the largest history museums in the United States and one of the leading museums serving families. The Strong houses the world’s largest and most comprehensive collection of historical materials related to play and is home to the International Center for the History of Electronic Games, the, the World Video Game Hall of Fame, the Brian Sutton-Smith Library and Archives of Play, the Woodbury School, and the American Journal of Play. Do you agree with these choices? Why or why not? Leave a comment!